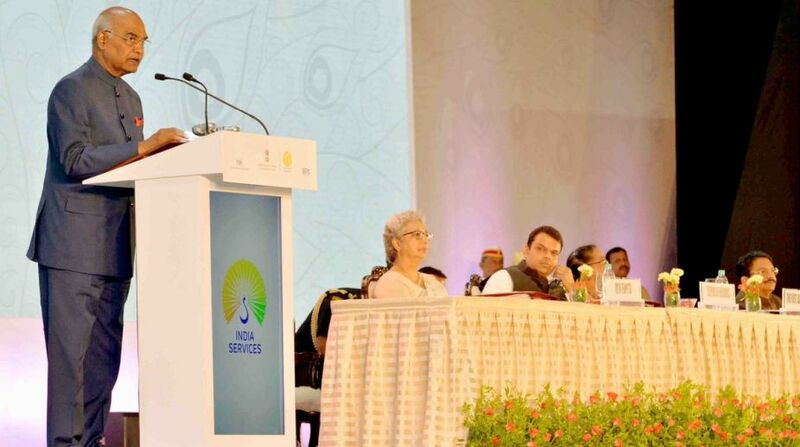 President Ram Nath Kovind inaugurated the 4th Global Exhibition on Services and launched a portal on 12 Champion Sectors in Services in Mumbai on Tuesday. Speaking on the occasion, the President Kovind welcomed around 500 international delegates who are participating in this Global Exhibition from about 100 countries. Kovind commended the Ministry of Commerce and Industry of the Government of India, as well as the Government of Maharashtra, the Confederation of Indian Industry and the Services Export Promotion Council, for this initiative. The President expressed confidence that it would promote the Indian services domain and enlarge and deepen India’s engagement with the global services sector. He stated that the launch of 12 Champion Sectors is a bold new step that will contribute to both India’s economy and the global economy, and will create jobs. Kovind said that the services sector represents a vibrant and expanding component of the global economy. Today, services dominates in terms of employment, value addition, productivity and innovation. The pace of technology is intensifying the contribution of services in other sectors – including agriculture, infrastructure and manufacturing. It would not be an exaggeration to say that services forms the backbone of the 21st century global economy. Kovind said that in India, the services sector contributes 61 per cent in gross value added. With its young population, large talent pool and comfort with technology, India has natural advantages in the sector and is set to become even more of a provider of services to the world. President Kovind said that the early Industrial Age and the traditional manufacturing economy created jobs in factories, and encouraged entrepreneurship in the form of ancillary units and workshops. Today, we are looking at small but exciting start-ups in the services space. Technology has emerged as an enormous enabler and allowed local services companies to go national or even global. In India, which is the third largest centre of start-ups in the world, this has thrown up a generation of young entrepreneurs, of men and women with hunger and ambition, he said. The President noted that Government programmes such as Start-up India and the Mudra Yojana, which has provided capital to 120 million grassroots businesses, have seeded a culture of entrepreneurship, largely in services. He expressed confidence that some of these start-ups will grow into giants in the years and decades to come.